Tongariro National Park is one of the most visited parks in New Zealand. 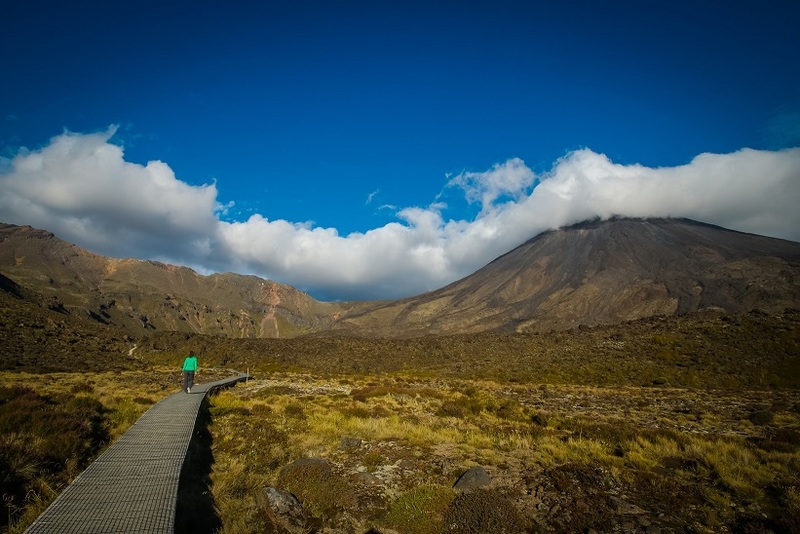 Over 100,000 visitors coming to hike the famous Tongariro Crossing each year. 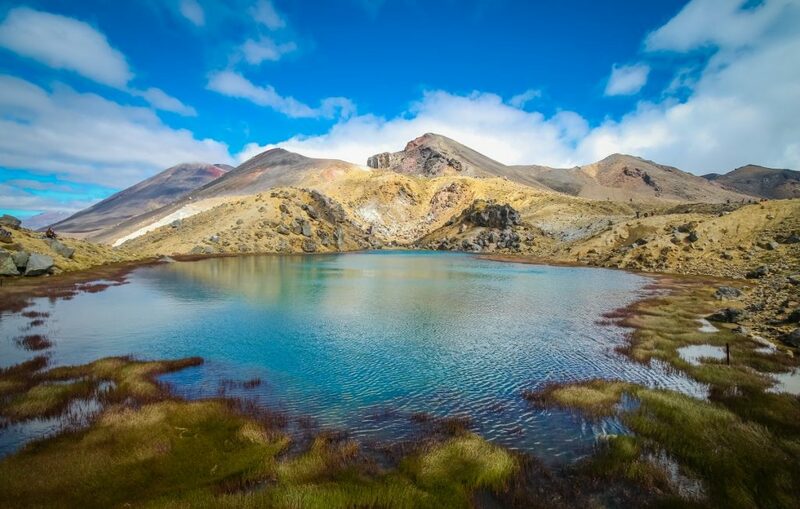 This day hike is part of the Tongariro Northern Circuit, one of New Zealand’s Nine Great Walks. It traverses through areas of volcanic activity, stunning emerald lakes, old lava flow, and several steam vents. Made famous by The Lord of the Rings franchise, Mount Ngauruhoe AKA Mount Doom looms over the park. Many come only for the day hike, but the full Northern Circuit is a great way to come explore the park and enjoy other beautiful scenery not seen on the crossing. 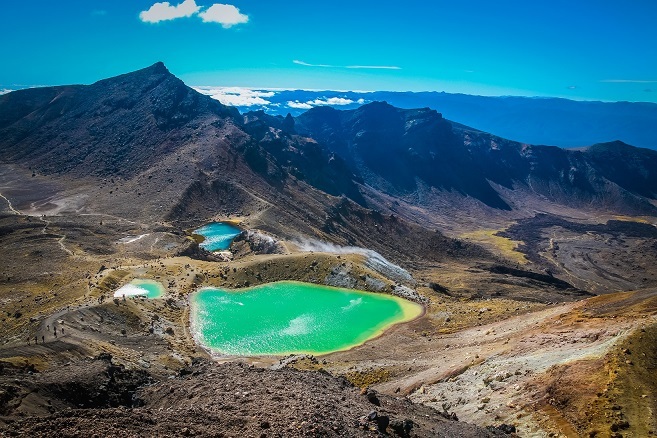 Tongariro National Park is located four to five hours south of Auckland, and one hour south of Lake Taupo. The Great Walk season is from October 20 – May 1. During the season, the huts and campsites require prior bookings. In season, huts have cooking stoves and a resident hut warden. Out of season, huts are first come first serve with discounted rates (see How to Book for costs), and without cooking stoves. 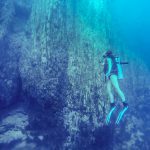 The hike can be done out of season within the first couple of weeks before and after season closes depending on weather. During the winter, experience in alpine and snow/ice conditions is required. The circuit can be done in three to four days. There are three huts on the circuit. Oturere Hut to Waihohonu Hut are only two hours apart. For a three-day hike, one of these huts can be skipped. For more details on hut locations, distances and maps, check out the DOC website for the Tongariro Northern Circuit. Huts and tent camping must be booked during the Great Walk season. 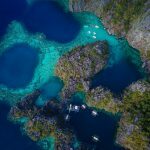 Huts can book out far in advance during peak summer season. Campsites cost $15 pp and huts cost $36 pp in season. Out of season, campsites are $5 pp and huts are $15 pp, paid by hut tickets or with a backcountry hut pass. Both are obtainable from any DOC Office or visitor center. Book online for in season at the DOC’s website. Whakapapa to Mangatepopo and to the summit of Mount Ngauruhoe, return to Mangatepopo. The start of the circuit is either from the Whakapapa Village or the Mangatepopo carpark. We began from the Whakapapa Visitor Center starting on the Taranaki Falls Track towards Mangatepopo Hut. The beginning of the trail is through forest and crosses the Taranaki Stream. It is two and half hours to Mangatepopo Hut, which can be a short walk for one day. We added on the summit hike to Mount Ngauruhoe (Mount Doom) on this day. By noon, most of the day hikers were gone so we could enjoy the summit hike with less crowds. With just a small daypack, it took 5 hours from Mangatepopo to summit Ngauruhoe and return to Mangatepopo Hut. Time: 6 hours 23 minutes. From Mangatepopo to Oturere Hut, most of the day is the famous alpine crossing. Day hikers start passing Mangatepopo Hut around 7am, so we had an early start to the day to stay ahead of the thousands of day hikers. There are two detours on the trail, Mount Ngauruhoe (which we hiked the day prior) is a 3-hour return detour from the trail. 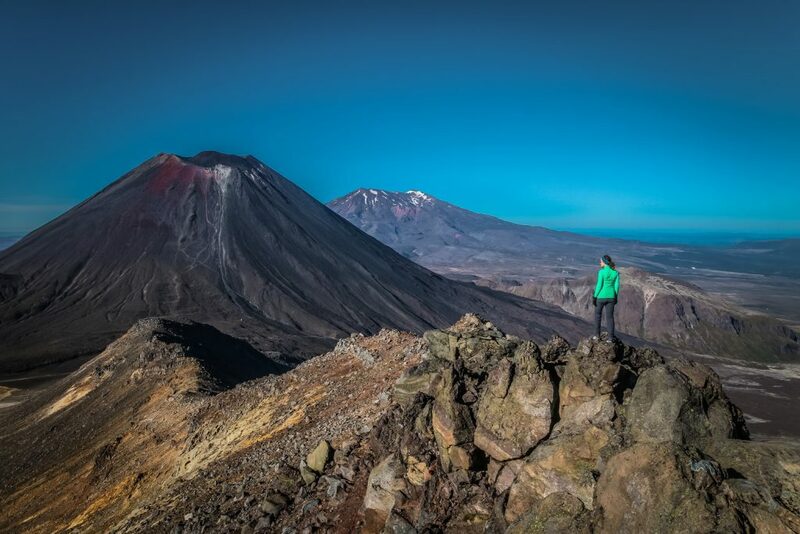 Mount Tongariro is a one hour return detour with excellent views to Ngauruhoe. 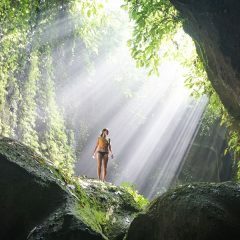 (Writing this feels like a tongue twister) From the Red Crater, the trail descends down to the beautiful Emerald Lakes. Day hikers continue to Blue Lake and onwards to the finish at Keteahi. The Northern Circuit trail continues in another direction from the Emerald Lakes through a section of old lava flow until reaching the Oturere Hut. Located in a scenic location, there are excellent views of Ngauruhoe as well as a beautiful waterfall. For those doing a four-day hike, the third day is a very short one. The hike from Oturere to the final hut on the track, Waihohonu Hut, is only a 2 hour walk. It is possible to skip Oturere or Waihohonu to make this a three-day hike. Oturere is in a more scenic location, however Waihohonu is an enormous brand new hut. From Waihohonu, it is another three and half hours back to the village. 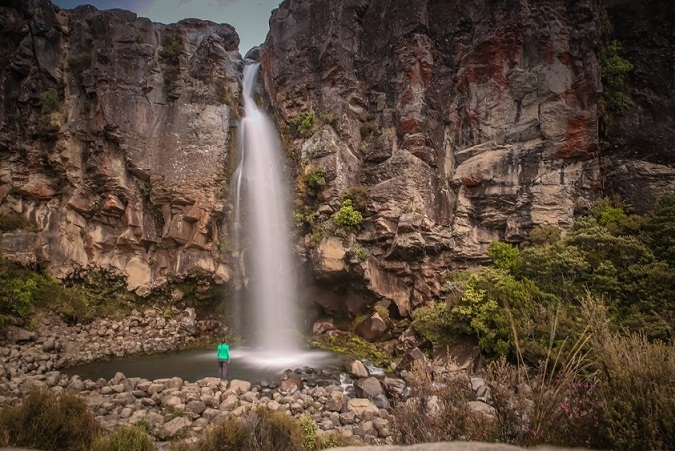 Shortly before Whakapapa there is a beautiful stop at Taranaki Falls. The Tongariro crossing is the most visited day track in New Zealand. The crossing is the best section of the Northern Circuit and a wonderful hike when visiting New Zealand (or for Kiwi’s too!). Most begin at Mangatepopo Car Park and end at Keteahi. Transport is required back to your car. So make a friend, hitch hike, or hire a bus shuttle for $30 each. Book with Mountain Shuttle, Tongariro Expeditions, or Alpine Shuttles. This hike is in alpine conditions and weather can change drastically, even in the summer. Be prepared for rain/snow at all times. Temperatures at the top of Mount Ngauruhoe can be very cold and windy, it is good to bring an extra layer. 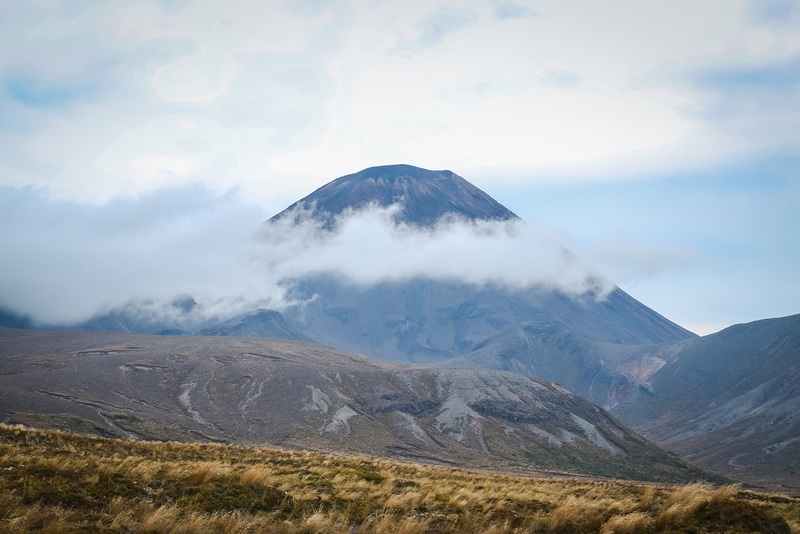 To reach the summit of Mount Ngauruhoe, it is very steep and consists mostly of loose volcanic rocks (scree). Try to climb up on the hard protruding lava rocks (further left) and descend down the loose scree (further right). Water is available at each hut. Water is not filtered and you can filter/boil for your own precaution, however hut water is almost always drinkable in New Zealand. Huts have gas stoves for use, approximately 6 – 8 burners at each hut. Tent campers can also use the hut stoves. There are no cooking utensils or cookware for use. The Whakapapa visitor center will check a bag for $3 during your hike.